With Christian Thielemann’s 60th birthday just weeks away (April 1), it’s timely to be reporting on this Profil release that can certainly be a promising testament to his imposing attributes in the world of conducting. The CD, comprised of four Strauss compositions, can be evenly divided and categorized into the “youthful” Strauss and the “seasoned” Strauss. The music scripts along an enclave of ebullience with a sudden avalanche into sobriety. What better place to start than focusing on an energized teenager and his affection for the horn. This wind instrument had immeasurable density and destiny for young Strauss since père was the principal horn player for Munich’s Court Opera. Richard Strauss’ ability to “color by degreed intensity” is hallmarked inside the glistening Concerto for Horn and Orchestra, featuring the scintillating exercises of Robert Langbein. We have a master at the helm since this young man has been a principal with the Staatskapelle since 2005. Imbued with Mendelssohnian flair and a Beethovenian catalyst, the concerto is one the most difficult pieces in the horn repertoire, but M. Langbein maintains firm control and poise throughout the three movements. His form moves with grand formation and elegant roundness at each note, but it’s within the conclusive “Rondo – Allegro” that Richard Strauss generates the most attention. In the closing bars, we hear the soloist steeped inside meticulous discipline with dizzying polished runs that act in superb sophistication. Horn aficionados will favor Robert Langbein’s approach. The Serenade is a compartmental delight. Upon hearing this select ensemble, it’s no surprise learning of Richard Strauss’ direction towards sentimentality and respectful glances back to his father. M. Thielemann glides through the score in a creamy format, never pushing more than what’s simply ample. Undoubtedly the gentlest of the four pieces, the depiction has elegant softness and soigné balance amidst a mild circumference of Mozartian sheen. ”Aus der Werkstatt eines Invaliden” (translated “From an invalid’s workshop”) was aptly subtitled since early on in this investment Richard Strauss was recovering from a bout of influenza. While the “allegro moderato” has piquant builds of harmonic ideas and parquet flourishes of clarinets and bassoons running amongst a lighter horn background, the composition also fluctuates into more of a thoughtful repose, giving hints at the effects of Der Rosenkavalier during the “Romance and Minuet.” Thielemann’s ensemble brilliantly sets up the “Finale” with subtly cadenced hemiola rhythms that continue to weave about in a pool of mild dexterity. The fugato (5’08) politely acquiesces, beginning with bassoon and bass clarinet which expands into the entire league housing a rambling and esprit dialogue. Superb. Christian Thielemann & Company, however, emphasize the quixotic twist when the final “Presto” (9’12) pathway is reached. The composition’s thematic subject is retained, and tutti winds contribute to address Strauss’ ingenious strategies, leading to an unexpected end. 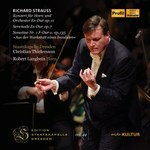 Richard Strauss had immense pliability, and this CD helps demonstrate the magnitude of variety the Bavarian could attain. While 16 instruments centered around the previous light-hearted Sonatina, it’s fascinating to see by just adding seven more players (this time all strings), that the shading and tenor of the music could take such a vast turn. Turn to page 64 of Torsten Blaich’s write-up and you will see a photo of the Semperoper’s destroyed stage. This is an ironic and bittersweet moment for Christian Thielemann. Closing the CD has personal and grave implications. Performing inside this venerable venue pays strong tribute to the man who brought so much to the world of classical music. Turn your shoulder and you see Strauss’ past dreams of hope and brightness, bitterness and intensity with remarkable concentration. Listening to this nearly half-hour contemplation shows Christian Thielemann and his cadre memorializing Richard Strauss in the most caring and demonstrable way: it pines, it reflects, it contemplates...it heals.